It is now officially fall, but summer is still in the air in Atlanta. I made this Easy Mexican-style Pasta Salad with Sausage from scratch with the last few tomatoes and peppers from my garden. 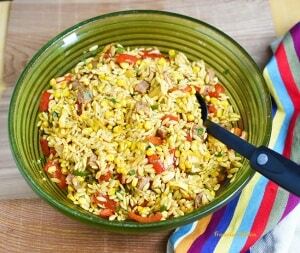 This salad is colorful and flavorful with all the roasted vegetables, sausages, and spices in it. 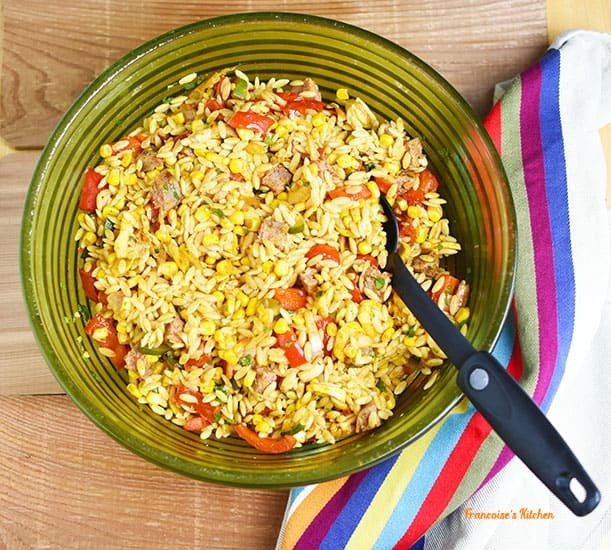 The lime-lemon dressing with its juice and zest nicely brightens this sunny pasta salad. 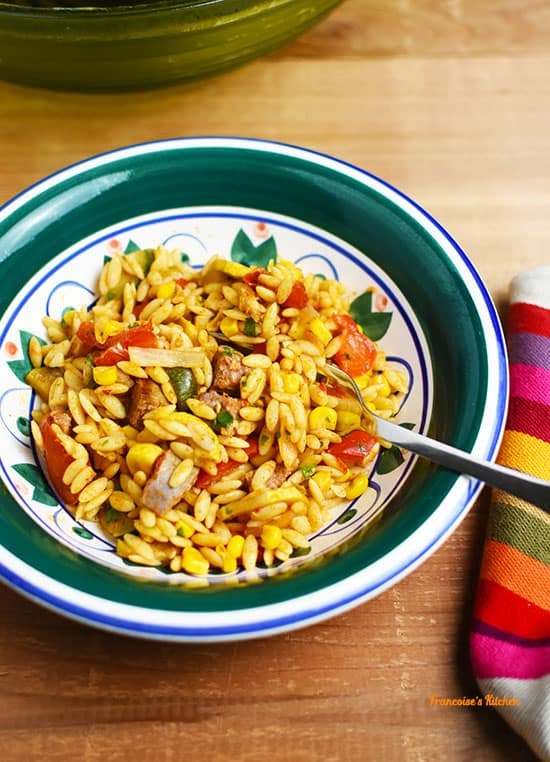 Orzo pasta is a rice-sized pasta that I really love to use in my salad rather than regular pasta because I feel the texture of the vegetables more than the pasta. This complete dish can be served warm, at room temperature, or cold. It’s perfect for dinner, lunch, or any occasion! 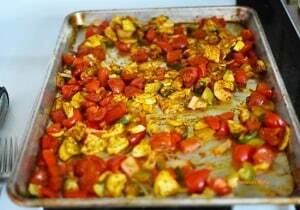 Spread all the vegetables on a baking sheet (except the yellow corn). Sprinkle all the spices (cumin, paprika, smoked paprika, chili, garlic, salt, and pepper) and drizzle olive oil on it. Toss the vegetables until they are evenly coated and spread them in a single layer. Put the baking sheet in the oven until they are lightly roasted (20-25 minutes). Toss once. Meanwhile, poke the sausages. In a cast iron or frying pan, add a small amount of olive oil and cook the sausages, over medium heat, until cooked through (160 F). Put them on a cutting board, slice and quarter them. Cook the pasta according to the package. Drain and place them immediately in a large bowl. Prepare the dressing. In a small bowl, mix all together the juice and zest of both lemons, maple syrup or honey, olive oil, salt, and pepper. Set it aside. 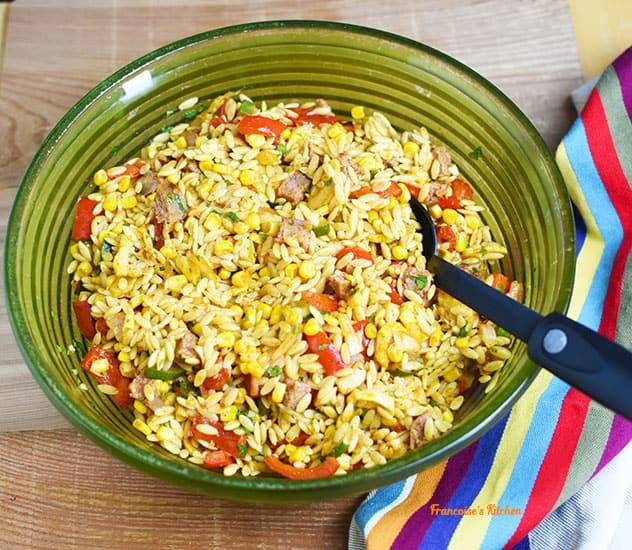 In the big bowl, toss the pasta, the grilled vegetables, the sausages, cilantro, and dressing. Mix well. Adjust, salt, and pepper to taste. You can eat this salad warm, at room temperature, or keep it in a fridge for a few hours.